The Deep South, unlike other parts of the country, never was featured often in industry retail photography during the golden age of retail. It is difficult to find quality photos of old stores and shopping centers in these places, but a few exist. One mall oddly stands out: Florence Mall in Florence, SC. What is curious is that this mall seems to have been featured in a couple postcards when it opened, thus preserving the memory of the long-demalled center in its glory days. 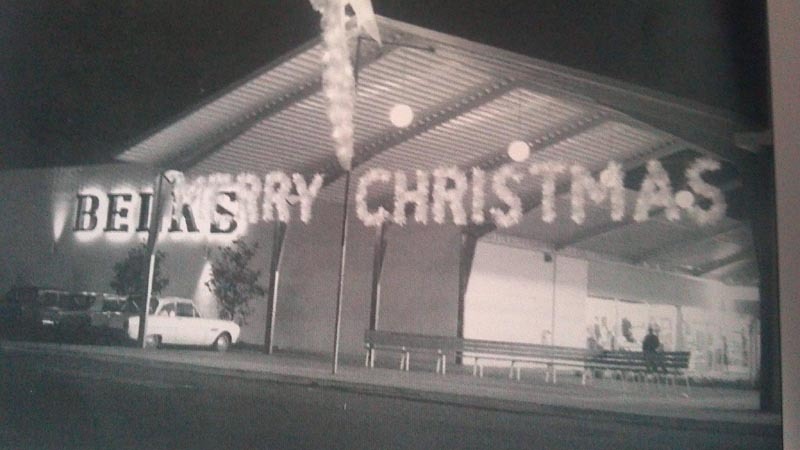 As one of the first malls in the state, it was never a large mall, but it had high visibility as an oasis for travelers en route to and from Myrtle Beach: a drive with long stretches of nothing in between. Located in a small city, this open-air center opened in on August 30, 1965 along U.S. 76 featuring department store anchors Belk and J.L. 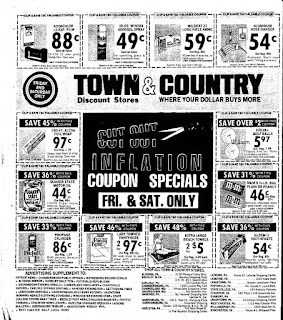 Coker Company as well as grocery store A&P and a Roses (five and dime). JCPenney would not arrive at the mall for two more years, but it would become the mall's largest anchor tenant. 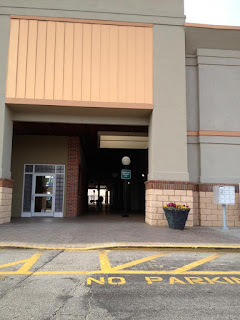 Another curious thing about the mall is its striking similarities to the original Richland Mall in Columbia and Tri-Cities Mall in Forest City, NC. Were they all built by the same developer? The developer of this mall was a partnership of Alexander Corporation and Masten-Langston Realty of Charlotte. 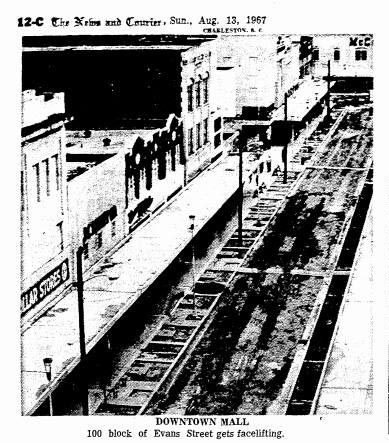 Downtown merchants were highly displeased with the opening of this mall, and they sought to steal some of the thunder by converting a portion of West Evans Street into a pedestrian mall in 1967. However, that project was too little, too late as JCPenney was already in the process of moving to Florence Mall with Coker's and Belk already at the mall. 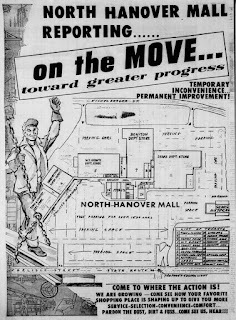 While the downtown mall would ultimately be removed, another mall rose up and overtake Florence Mall much sooner. 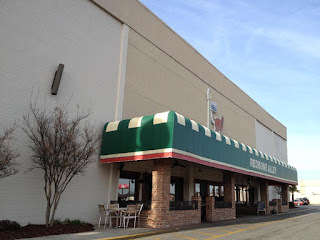 In all, Florence Mall was able to dominate the market for about 14 years until it was supplanted by larger, enclosed Magnolia Mall, which opened in 1979. Considering how much smaller it was than Magnolia Mall, it's not a surprise it lost its anchors, but the funny thing is it never really died. 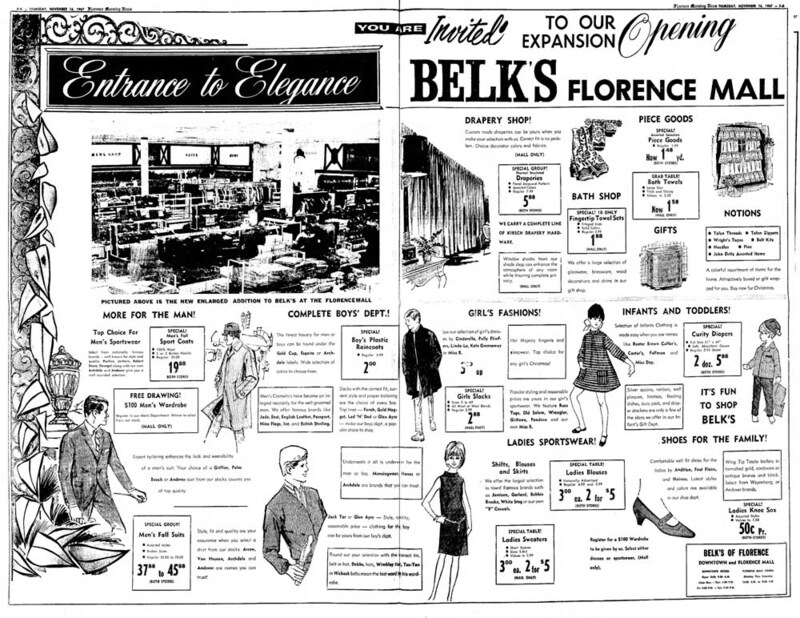 Postcard image by Ernest Ferguson of the mall in its prime followed by an image posted in the Charleston News (now Post) & Courier showing the mall's Belk store. People have asked if a mall still exists, and photographer Mike Kalasnik is about to find out. A low fence did not hold back Mike Kalasnik from checking out what was beyond. 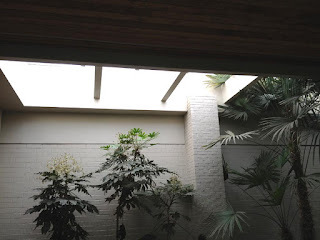 Scenes like this are why the old malls were so much better than the malls of today...a moody mix of dark tones and peculiar placement of skylights with trees and plants growing to them. Belk was originally on the right. Photos by Mike Kalasnik taken February 3, 2012. 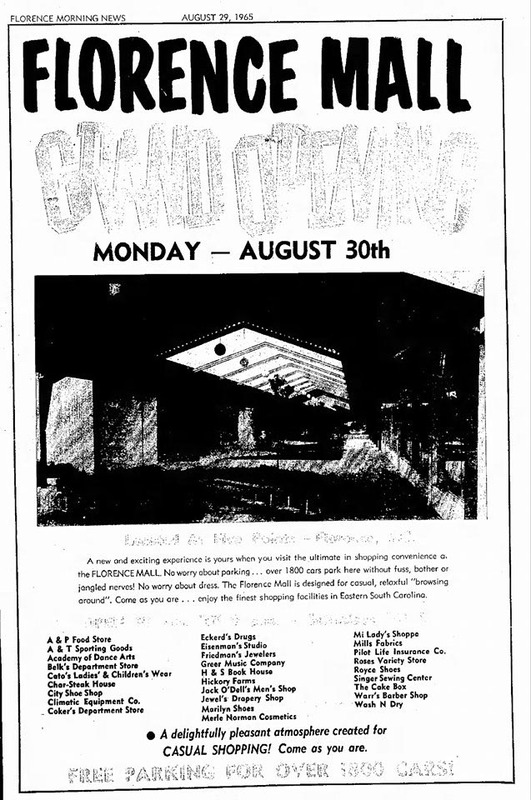 According to the Florence Morning News, two years after Florence Mall opened, the mall underwent a major expansion that added 126,000 square feet. 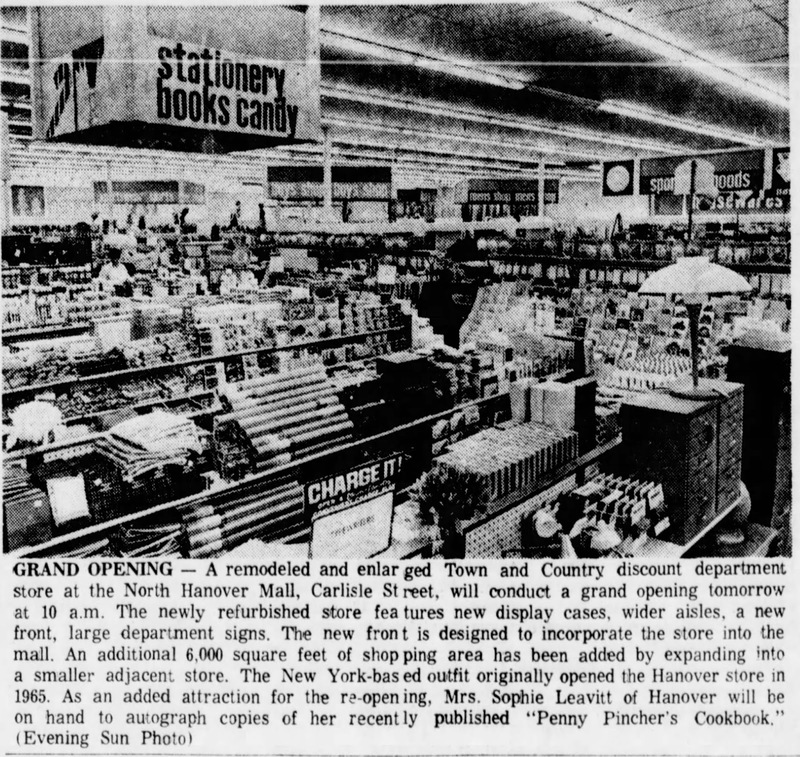 This addition, which opened on August 17, 1967, brought in the forementioned JCPenney along with 20 additional stores and a Piggly Wiggly on an outlot on the west side of the mall. 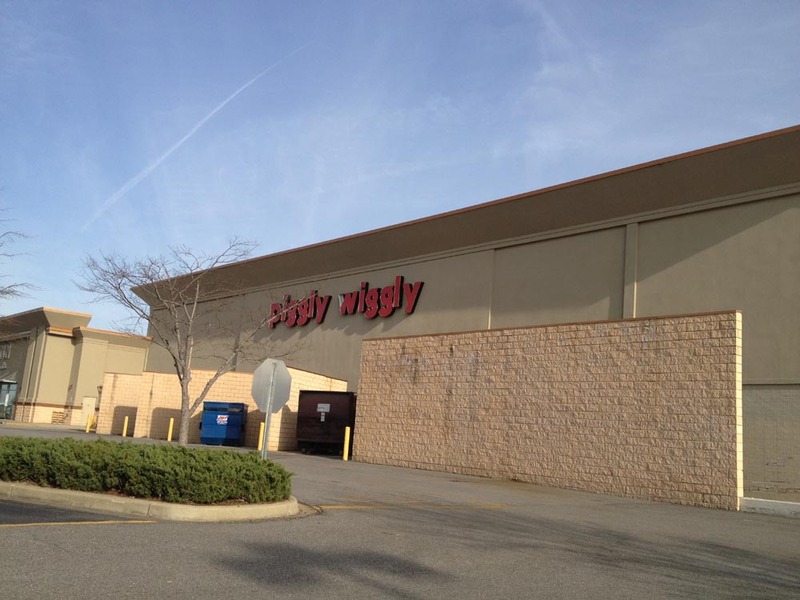 Piggly Wiggly would later take over half of the old JCPenney years after JCPenney departed. 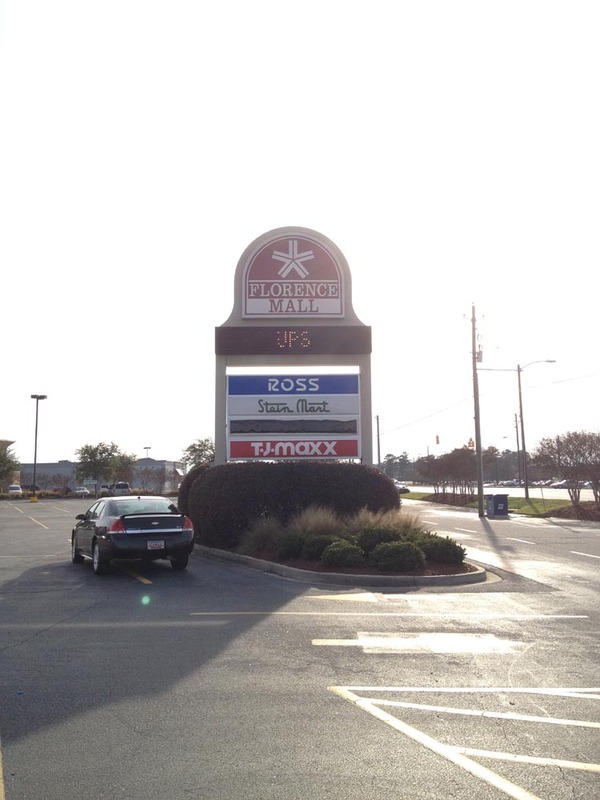 The former Piggly Wiggly today is subdivided among a Sprint store, Game Stop, Jos. 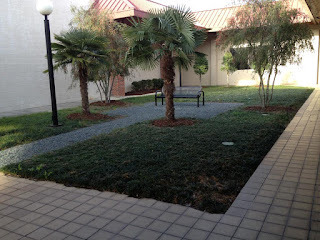 A Bank, and other tenants and is unrecognizable. In addition, Belk added 10,000 square feet to their store. This addition brought the mall's square footage up to 288,000 square feet. 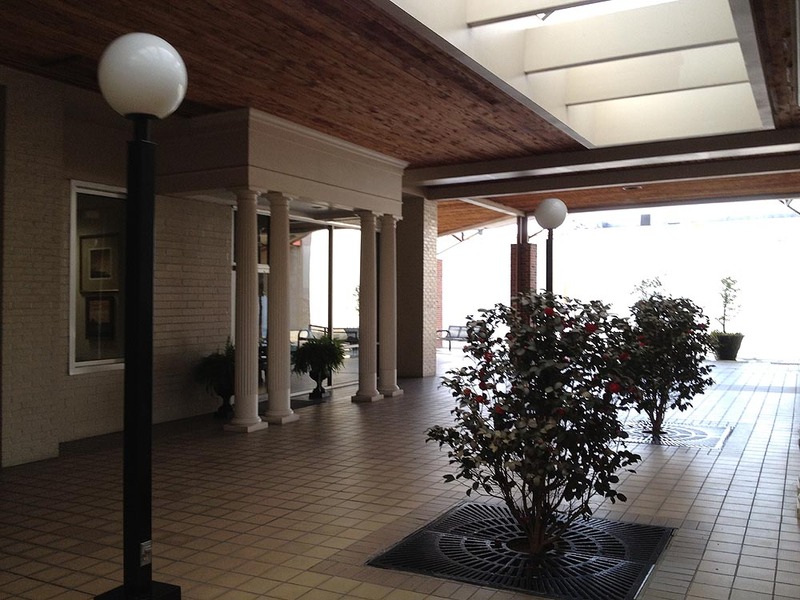 It was this addition that solidified the mall's position in the market while finishing off downtown Florence as a shopping destination. 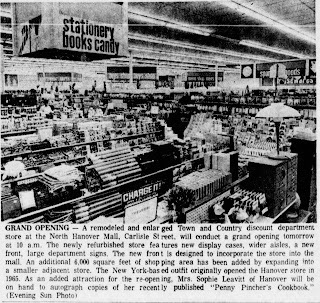 While no actual picture is available, here is an add from the Florence Morning News showing us its classic "Funky P" store as it looked when it opened on August 17, 1967. 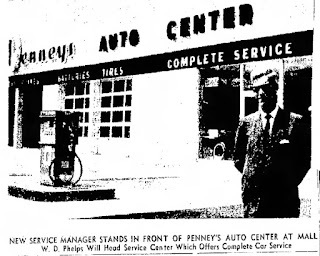 Even Penney's Auto Center makes a cameo in the grand opening article. It does not appear to still be standing and is most likely where Wells Fargo is today. (Florence Morning News, August 17, 1967). Porter's Gift Shop apparently moved from downtown to the mall during the 1967 addition and continued to operate there years after JCPenney and Belk departed closing sometime after 2012. 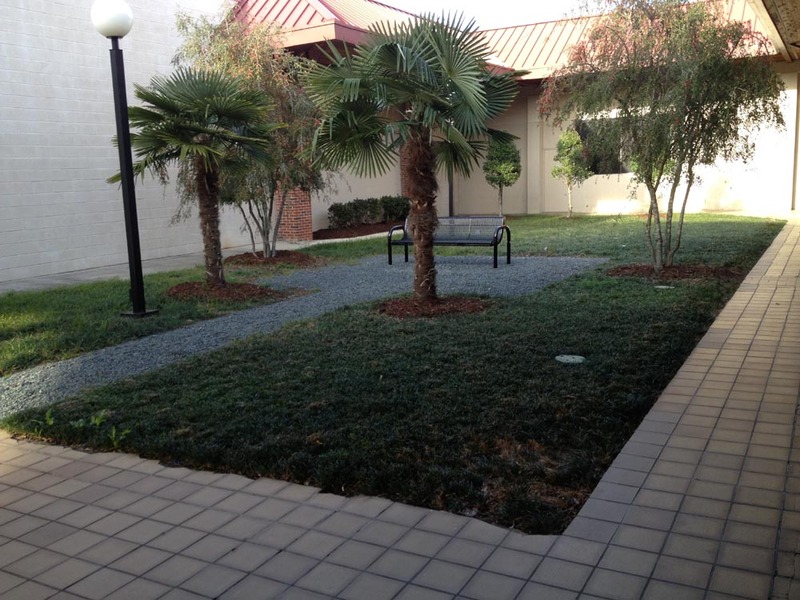 During the 2000's, the interior mall courtyard was mostly closed off to the public. 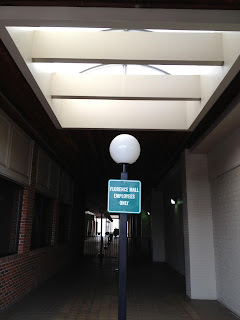 However, most people do not realize that much of the old mall is still there with the mall portion hidden from the public behind an "employees only" notice. Essentially, instead of converting the mall into a strip, the owners of the mall turned the mall inside out as basically a square strip surrounding a mostly walled-off mall corridor that now functions as a break area for employees and a back entrance for vendors, thus it is no longer open to the general public. 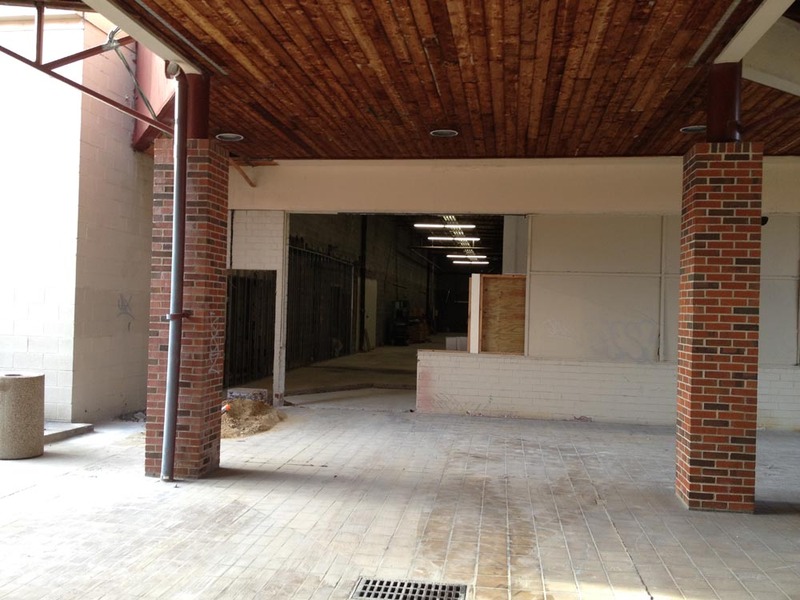 They achieved this by filling in all but one entrance corridor with stores. How often are these malls hiding from our view that were supposedly redeveloped? No 60's mall is every complete without a few faux-Colonial touches. Photo by Mike Kalasnik taken February 3, 2012. About to enter the mall. Photo by Mike Kalasnik taken February 3, 2012. 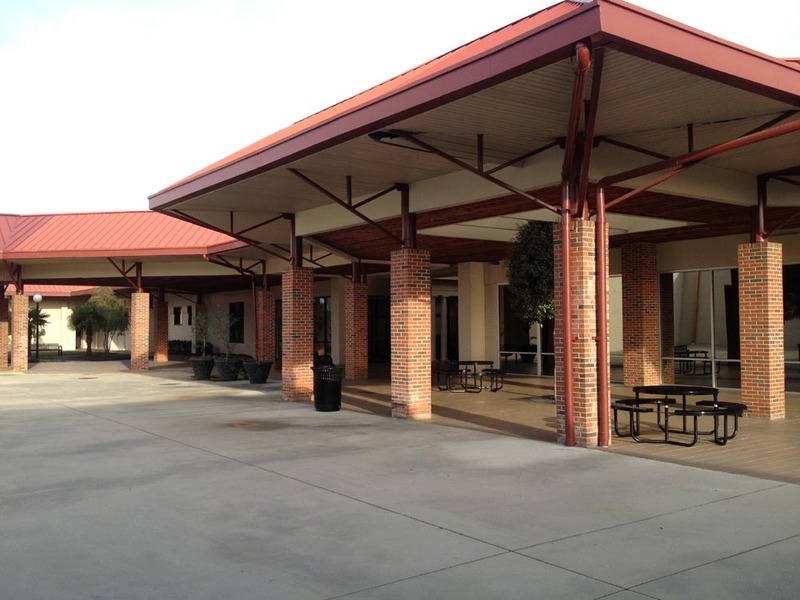 Looking back from the main mall to the one remaining entrance wing. Compared to the 1960's photo, the overhead walkways look completely different now. The entrance wing that still exists is on the NE side of the mall. Photo by Mike Kalasnik taken February 3, 2012. Looking northeast to the north end of the mall where the "MERRY CHRISTMAS" banner and Belk entrance off to the right was posted. In the background is now a wall for Ross, which filled in part of the mall corridor. Photo by Mike Kalasnik taken February 3, 2012. 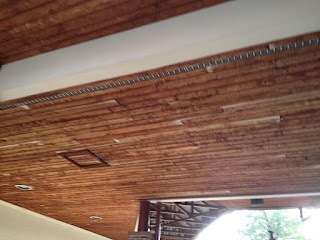 The wood-grained ceiling and update of the overhangs was most likely done sometime in the 1980's as a means of trying to renovate the mall back into legitimacy. It clearly did not work to save the interior mall. Photo by Mike Kalasnik taken February 3, 2012. Walking toward the former location of JCPenney. The planter itself might be original. Photo by Mike Kalasnik taken February 3, 2012. 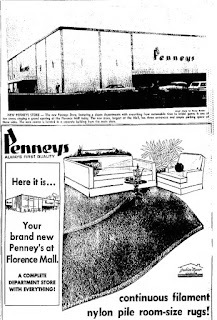 The curious thing about Florence Mall is that it did not follow the usual pattern of older open-air 1960's malls in that, while it died as a mall, it remains a major retail center as part of the retail corridor supporting Magnolia Mall nearby. By filling in the main entrance corridor and making the other entryways less accessible, they have effectively demalled the center without demolishing a single structure! 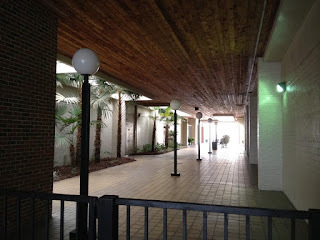 Compare that to other similarly designed open-air malls like Tri-City Mall in Forest City, NC. That mall is mostly vacant in the core despite two healthy anchors. 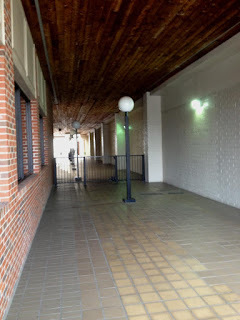 Also, unlike Tri-City Mall, the interior mall corridor apparently received a major update sometime in the 1980's or 1990's so that it does not resemble the postcard views of the mall with the A-frame canopies. Continuing toward the former JCPenney. Cokers was originally on the left. Photo by Mike Kalasnik taken February 3, 2012. Mike finds a mysterious door off to the left. Where did this door go? 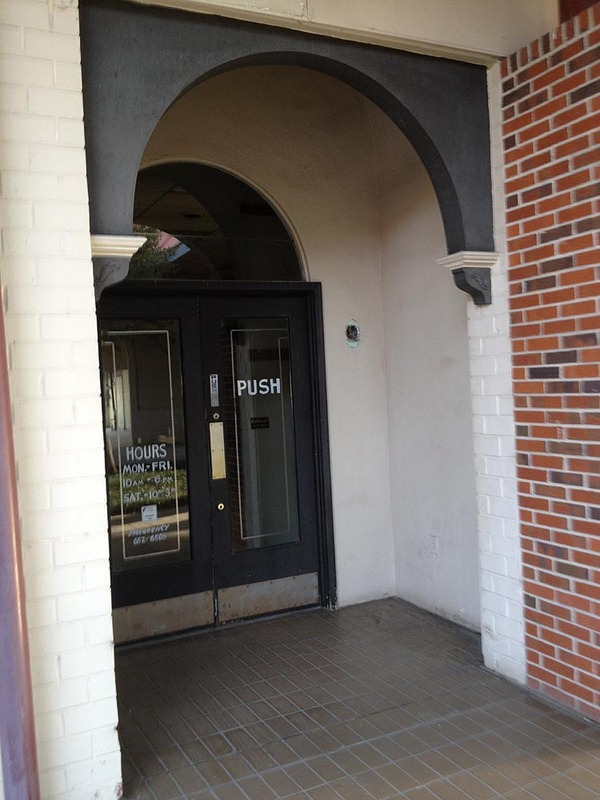 Was this the mall entrance to the original Cokers or was it something else? Photo by Mike Kalasnik taken February 3, 2012. To the right, Mike finds what appears to be the southwest mall entrance corridor opened up. It was sealed off after the 2000 "demalling"
Once upon a time, shoppers came upon the mall entrance to Funky P. Today, a few mall employees come across a giant concrete slab with an overhang covering an emergency exit. Photo by Mike Kalasnik taken February 3, 2012. 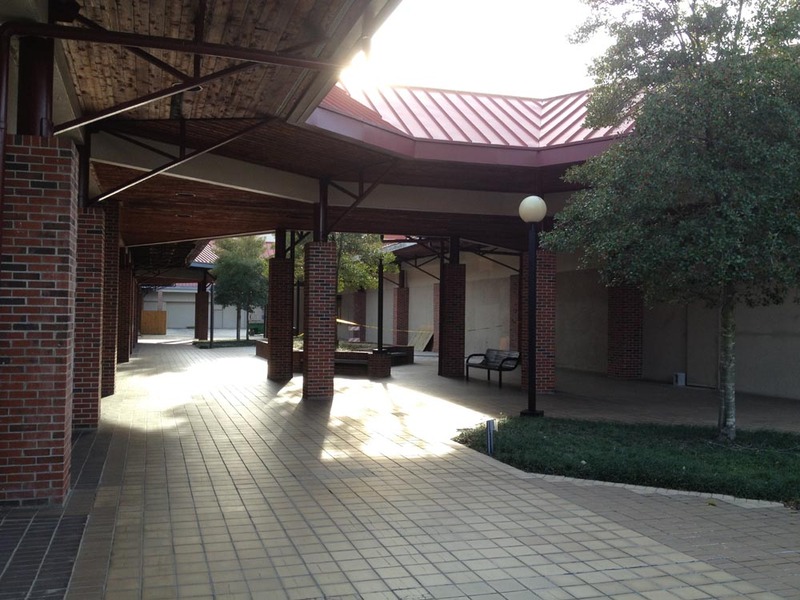 Looking away from the former JCPenney back into the main mall. 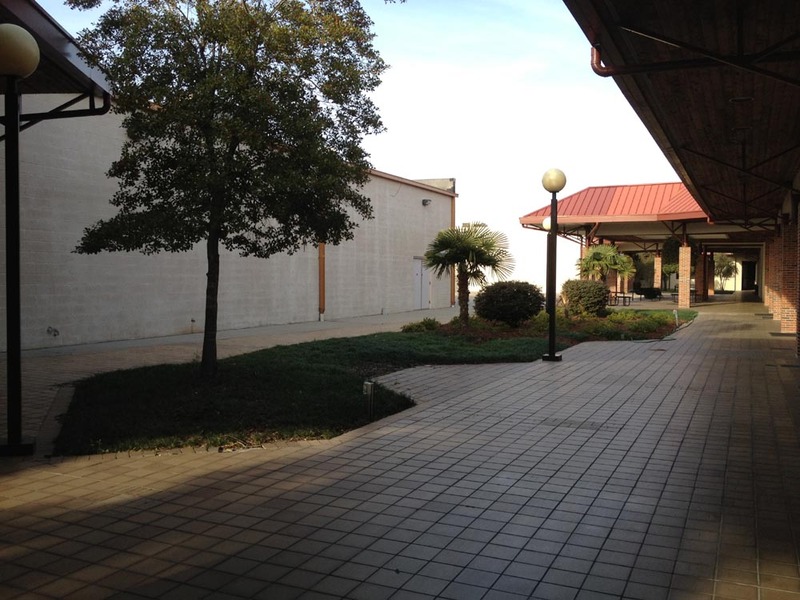 Why is the mall on the left suddenly a void here? Photo by Mike Kalasnik taken February 3, 2012. The loss of the interior mall was slow, but the anchor losses came very quickly. 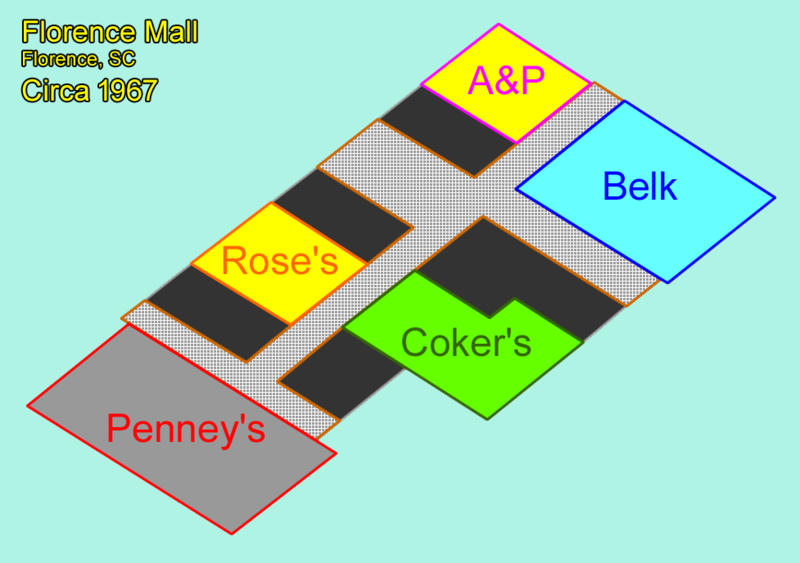 When Magnolia Mall opened, Belk, JCPenney and Roses all fled to the newer, larger mall. 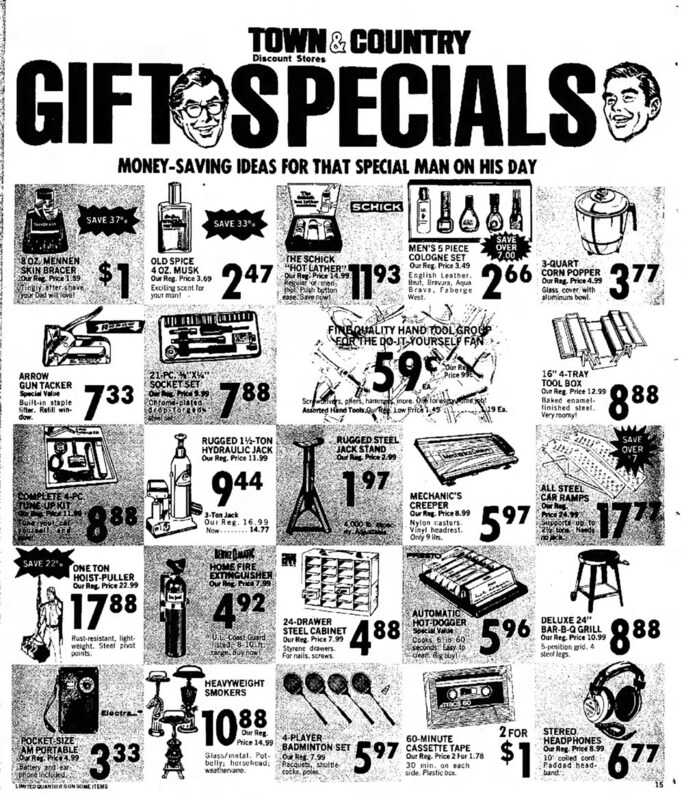 Belk and Roses left in 1979 while JCPenney left in 1980. Coker's was sadly left behind, apparently unable to afford the move. By 1982, they threw in the towel and closed the entire chain. 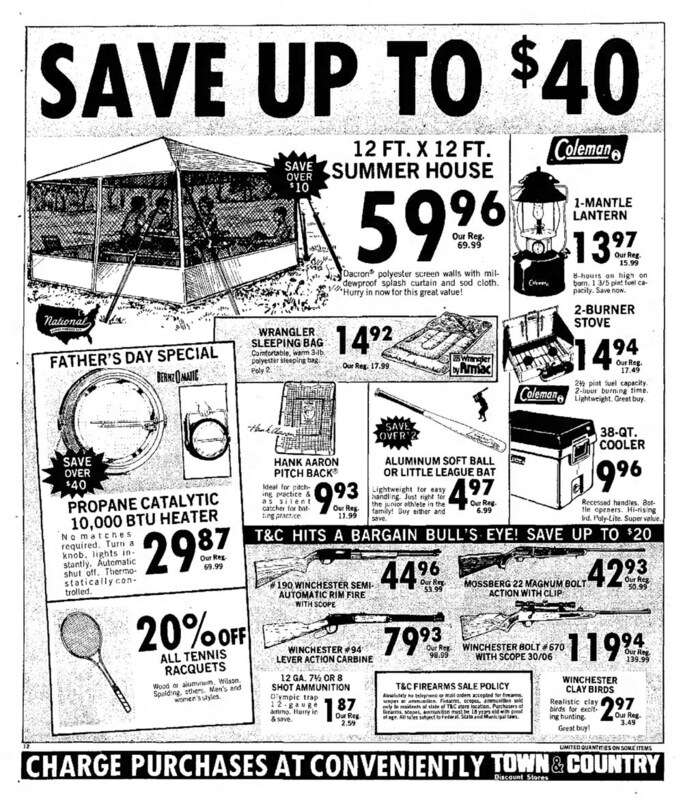 The loss of Coker's was not exactly a small deal. 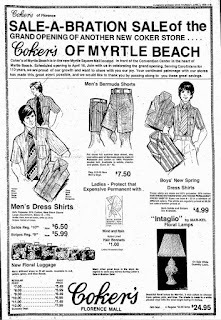 It was a department store that had been in business since 1865, and it had locations in Sumter, Myrtle Beach and a half-block long flagship store in Hartsville in addition to the Florence Mall store. 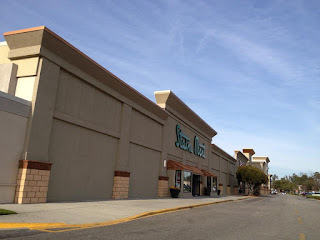 While not much is known about the store today, it was one of several prominent department stores in South Carolina that found they were unable to compete with the influx of larger, improved chain department stores and enclosed malls. 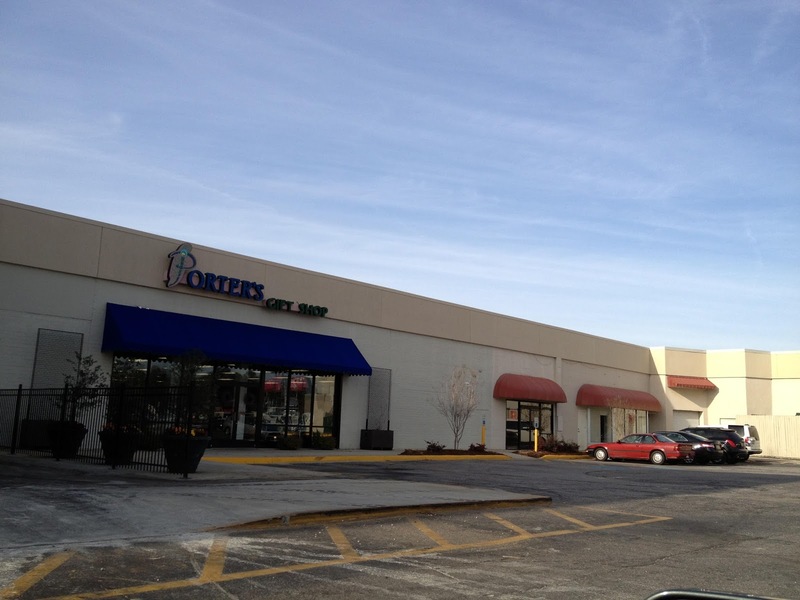 Coker's was sold at the mall, but it is not clear what it was immediately after it was sold. The loss of anchors did not mean that all of the empty stores anchors remained vacant, however, as it was still located on a hot retail corridor close to the new mall. 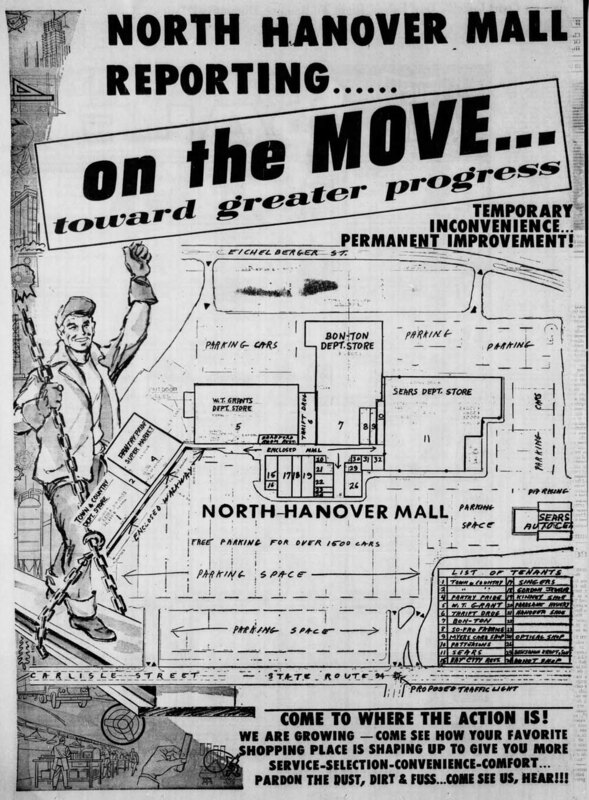 This meant that the once dominant mall was, for a few years, repurposed as an ancillary mall. 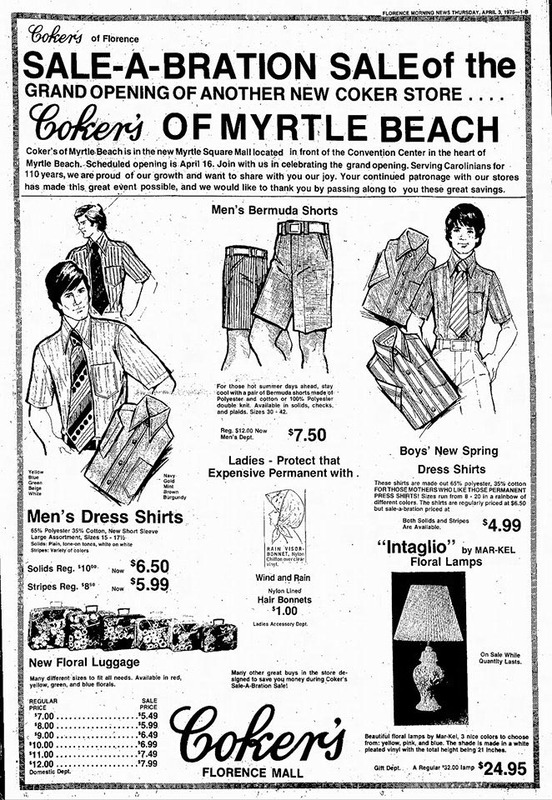 Cokers ad from 1975 from the Charleston Times (Post) & Courier. Photo by Mike Kalasnik taken February 3, 2012. 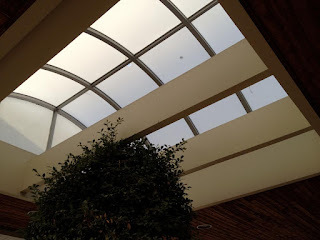 This one skylight is located near the "employees only" entrance in the main mall. Photo by Mike Kalasnik taken February 3, 2012. A very South Carolinian planter scene complete with palmettos. Photo by Mike Kalasnik taken February 3, 2012. 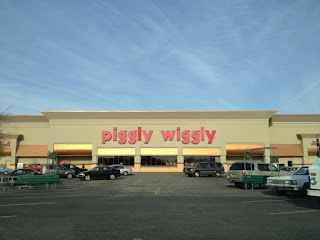 Piggly Wiggly (former JCPenney) with the former store entrance rather obvious based on architectural cues. 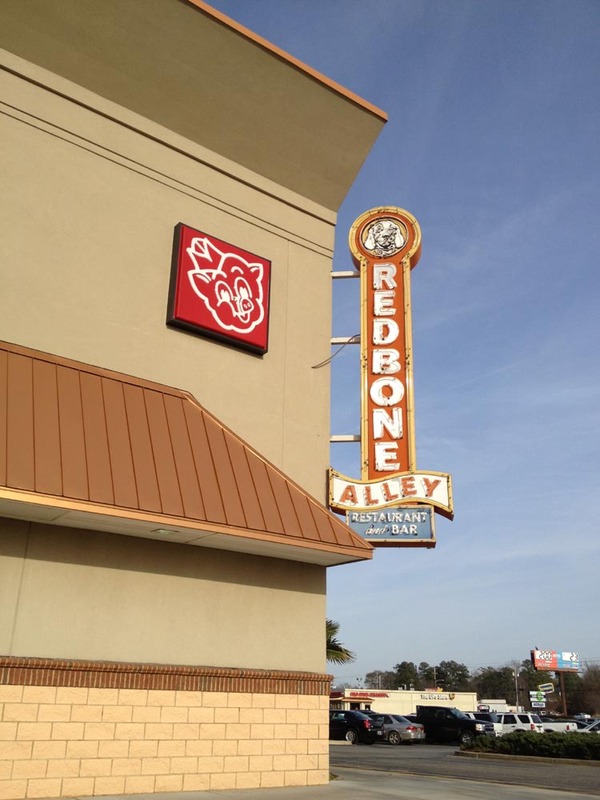 Redbone Alley takes over part of the store in the second photo. Photos by Mike Kalasnik taken February 3, 2012. 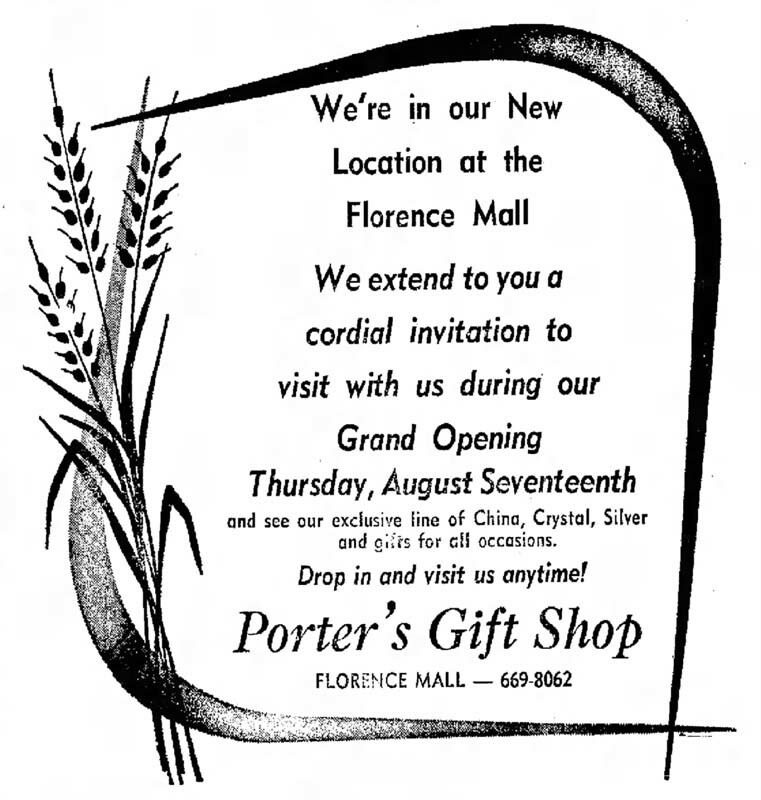 Something to remember is that, despite its small size, Florence Mall was a pretty substantial mall for its day. 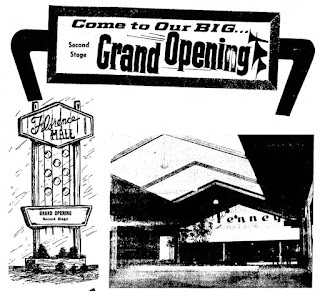 The mall included a national department store, five-and-dime, two grocery stores, a local department stores, and a regional department store. 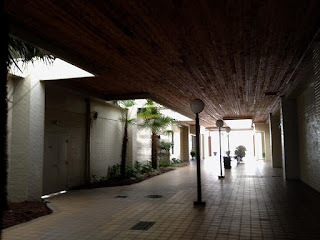 This also resulted in many stores having both interior and exterior access making the stores easy to fill when the mall itself began to fail. 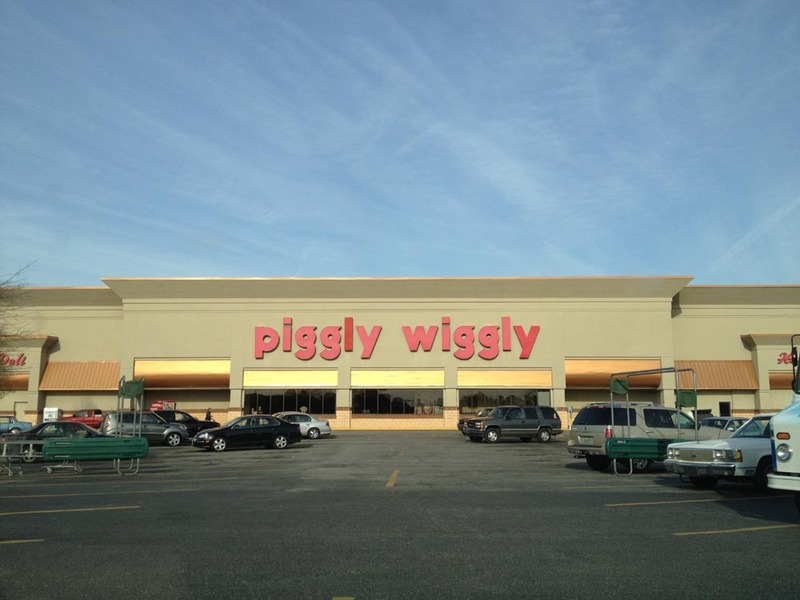 Belk was replaced by Peebles, and the vacancy left by JCPenney was later replaced in part by Piggly Wiggly in 1985. 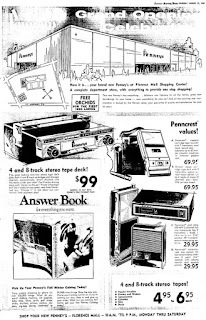 It is not certain about how long A&P remained, but it likely remained in the mall up until A&P pulled out of the market in the 1980's. It is not clear what else was there in the interim, but it did appear that the vacancies remained high in the mall throughout the 80's and 90's. Peebles most likely closed by the 2000's, consolidating with a nearby store that is today Goody's. Blink and you miss it. This is the narrow corridor that Mike found to access the real Florence Mall (what's left of it). Photo by Mike Kalasnik taken February 3, 2012. 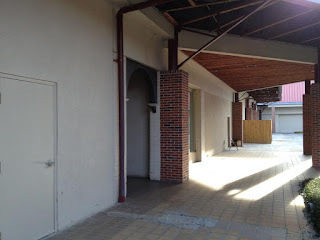 The back side of now-closed Porter's Gift Shop is the approximate location of the arched doorway found in the mall. What was this originally? 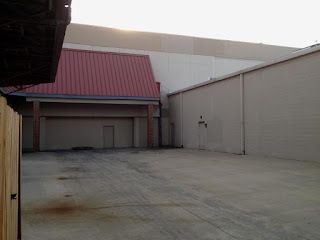 This is inset next to the former JCPenney on the left. On the right (not visible) is the former Coker's. Photo by Mike Kalasnik taken February 3, 2012. 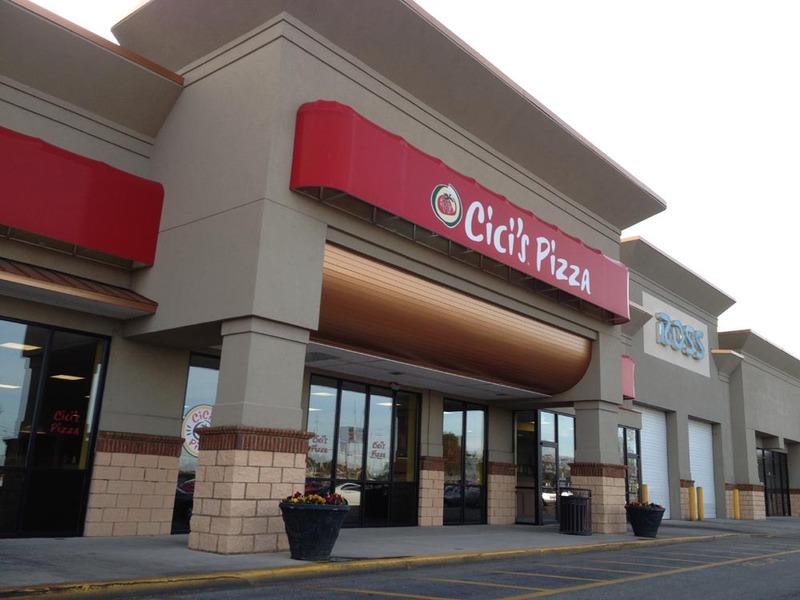 Cici's Pizza takes up part of the former Belk and covers up the northern mall entrance corridor. 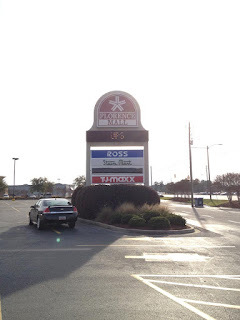 This is the precise location of the "MERRY CHRISTMAS" banner next to Belk, but facing in the opposite direction. Photo by Mike Kalasnik taken February 3, 2012. 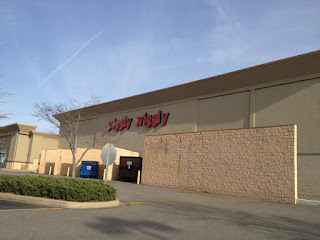 Piggly Wiggly from this angle gives no indication of its former life as JCPenney. Photo by Mike Kalasnik taken February 3, 2012. 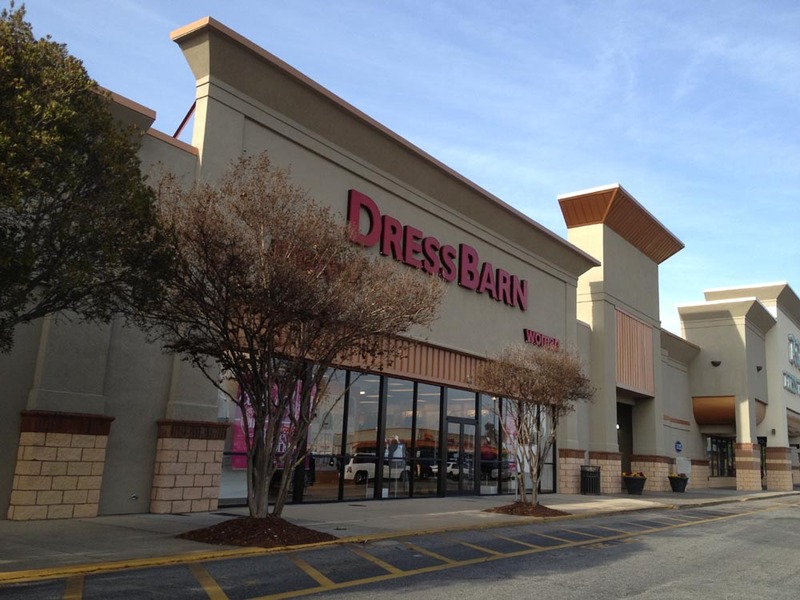 Dress Barn fills in tenant space next to the one remaining interior entrance corridor. Photo by Mike Kalasnik taken February 3, 2012. Rugged Wearhouse is owned by Gabe's (formerly Gabriel Brothers) and Shoe Carnival filled in former mall space and the front entrance corridor. Photos by Mike Kalasnik taken February 3, 2012. In 2000, the mostly dead mall got its makeover by turning the mall inside out. By that point, what stores were left mostly had parking lot access and closed off their access to the mall itself chosing instead to face the parking lot. 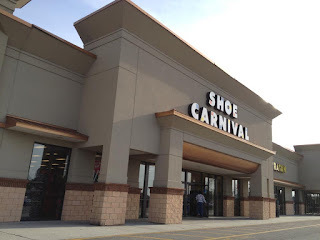 This resulted in a closure of the mall around 2008 to the public with the rest of the stores filled with mostly big boxes. 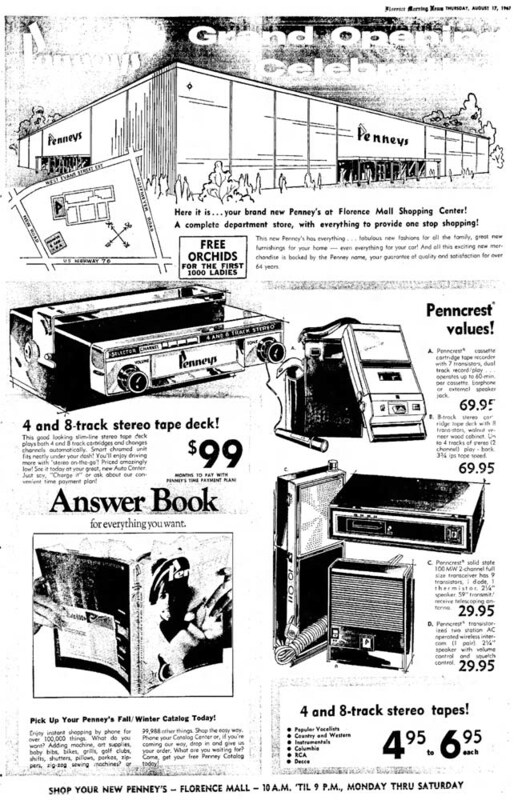 It helped that every anchor except for JCPenney was a smaller inline store. Thus, quite a few anchor changes took place since 1979. Peeble's later closed and was replaced by Ross, which uses part of the original mall area for storage and deliveries. Coker's is today Stein Mart, which means it is possible this was an early location of Stein Mart (opened in the 80's). T.J. Maxx also came to fill the A&P slot that had previously been subdivided into smaller stores. 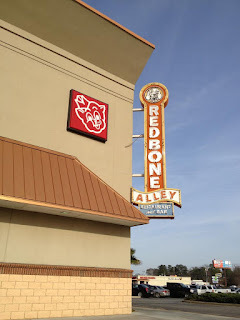 Redbone Alley took over the vacant half of the former JCPenney next to Piggly Wiggly, and the former Rose's became Ulta. 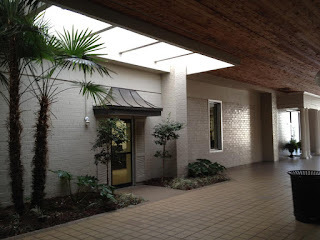 Other stores would follow turning a dead open-air mall into a very healthy, but oddly shaped strip mall. 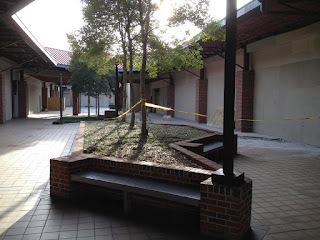 What was done was what needed to be done, but it is a shame these stores cannot open up into the courtyard to give shoppers an option to relax in the middle of shopping. Stein Mart had originally operated as Coker's Department Store from 1965-1982. Photo by Mike Kalasnik taken February 3, 2012. 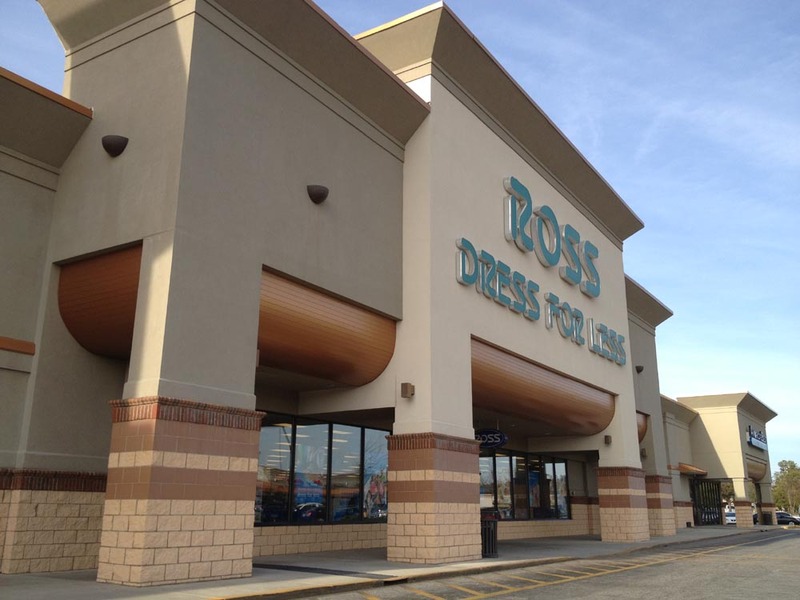 Ross was Belk from 1965-1979 and was Peebles for an unknown period after Belk left the mall. Photo by Mike Kalasnik taken February 3, 2012. 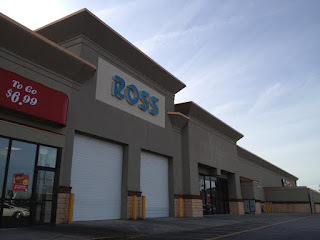 Ross's delivery entrance is what was originally the northern entrance to the mall corridor with Belk on the left and A&P on the right. Photo by Mike Kalasnik taken February 3, 2012. 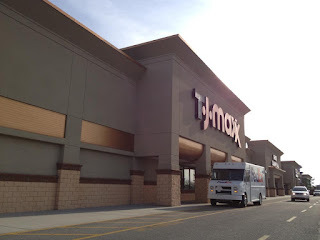 T.J. Maxx was formerly A&P and faces the front of the mall. Photo by Mike Kalasnik taken February 3, 2012. 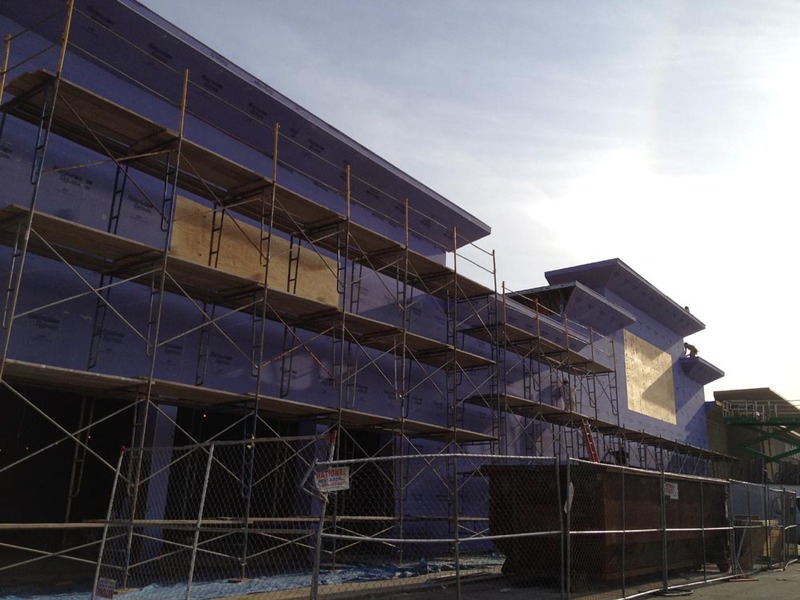 Petco, Ulta Cosmetics, and JoAnn Fabrics are under construction in this view. 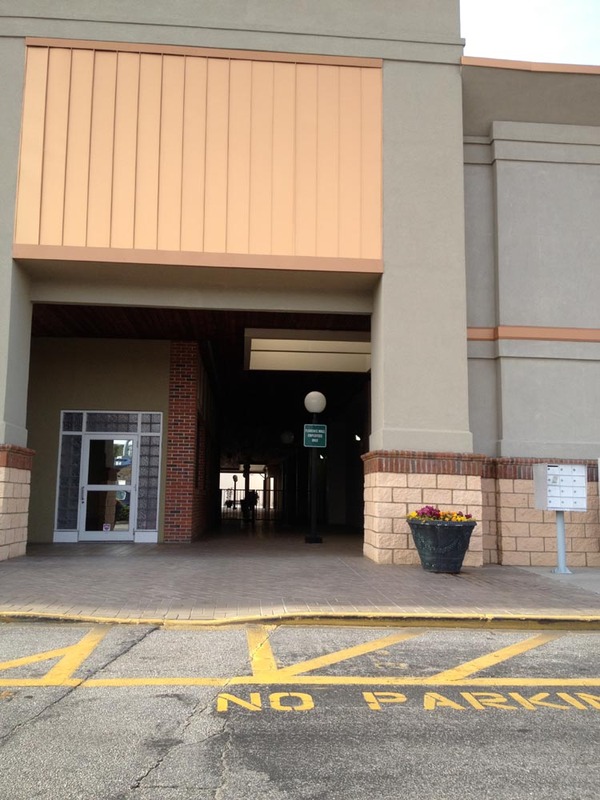 JoAnn filled in what was a front mall entrance corridor next to JCPenney. Ulta was originally the Roses location. Photo by Mike Kalasnik taken February 3, 2012. The mall's logo being an asterisk is highly appropriate since it is a *mall. Photo by Mike Kalasnik taken February 3, 2012. In a sense, Florence Mall has come full circle. 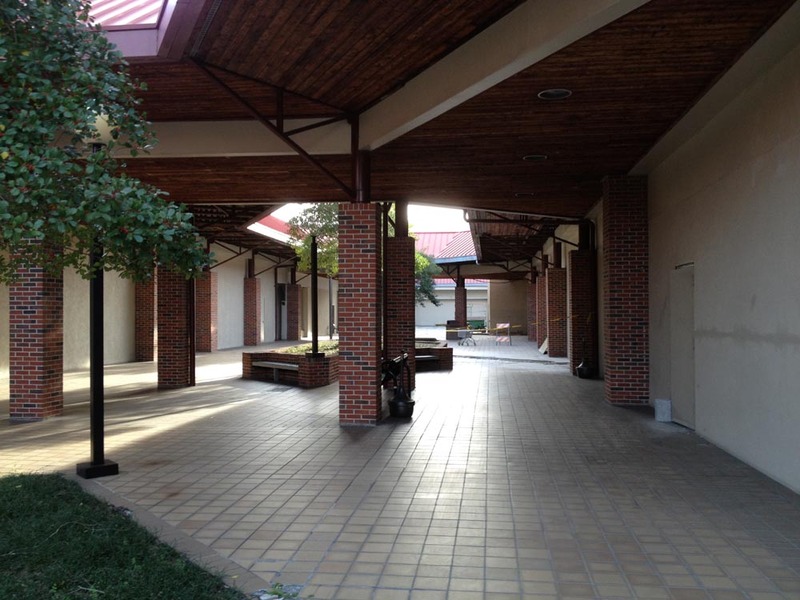 While new tenants filled in much of the mall's old space, many smaller tenants remain vacant in the middle of the closed-off mall. Today, that interior mall is being marketed for office space while the exterior is the healthiest it has been since the 70's. Meanwhile, nearby Magnolia Mall is starting to struggle from the troubles with the department store industry. 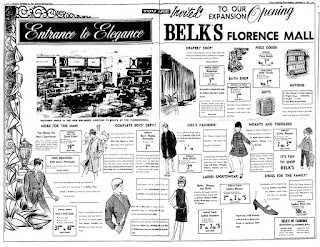 Both Sears and JCPenney have left the mall leaving only one traditional department store left with Belk. These vacancies at Magnolia Mall may again pull stores from Florence Mall who will be seeking deals from desperate mall managers. 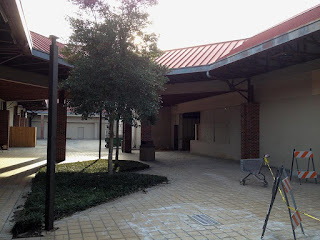 While it is good that the mall was not actually torn down, it would be nice to see what was there one day opened again to the public: perhaps in a time after larger superregional malls like Magnolia have run their course. Grand opening ad with full list of original tenants. Notice that JCPenney is not listed. It did not arrive for nearly two more years. Image from the Charleston Times (Post) & Courier. Downtown's reaction to the construction of Florence Mall. Image from the Charleston Times (Post) & Courier. A crudely-drawn map produced in 2013 showing the approximate original anchor line-up in the mall and orientation of corridors. 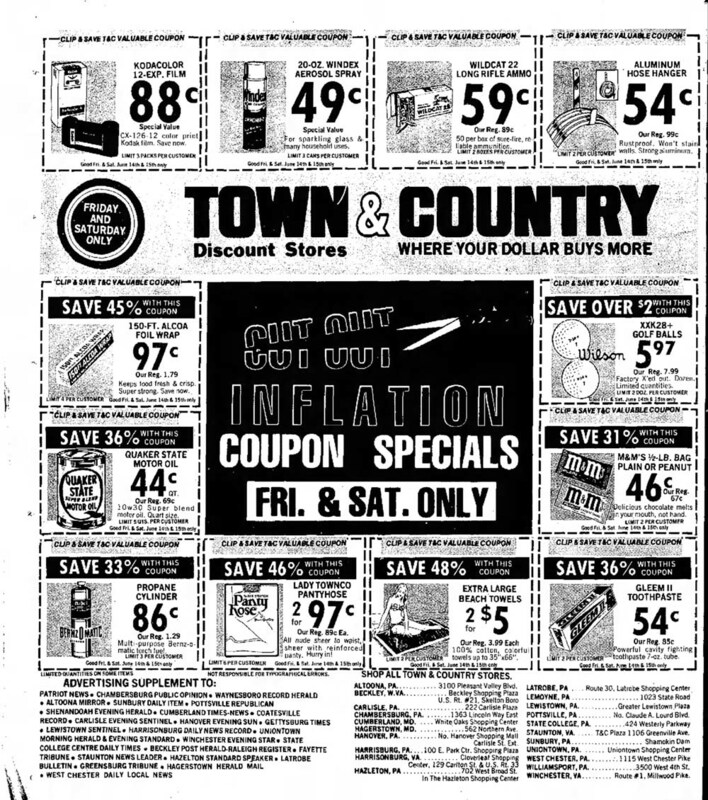 Something that has been very curious to me is the discovery of a defunct discount chain that apparently everyone forgot about: Town & Country. 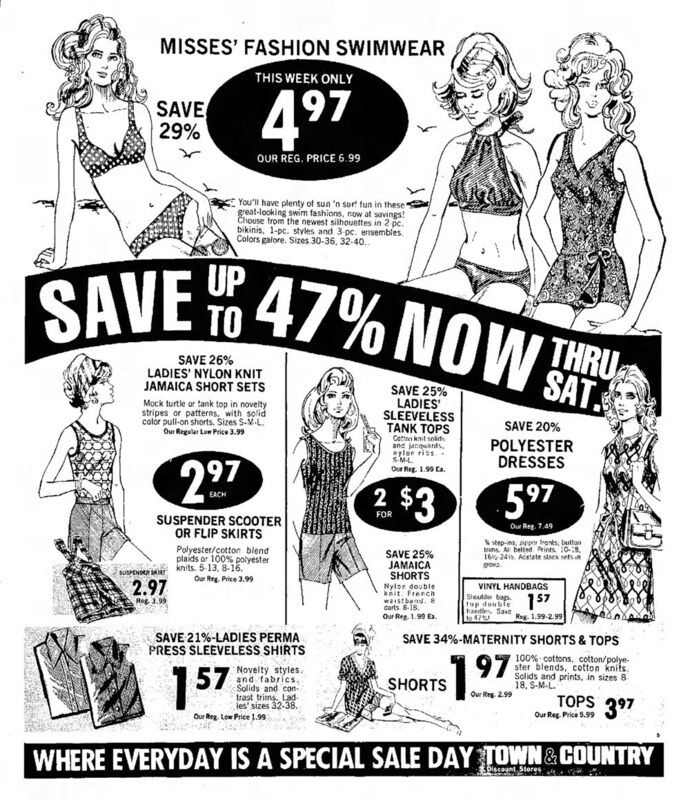 In 1961, they were purchased by Lane Bryant, which quickly expanded the chain. 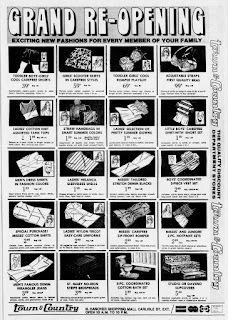 Prior to the purchase they were a Harrisburg-based operation with six small discount stores and a catalog service. As they grew, they were mostly located in Pennsylvania, but they expanded to three locations were in Virginia, two in Maryland, and one in West Virginia. 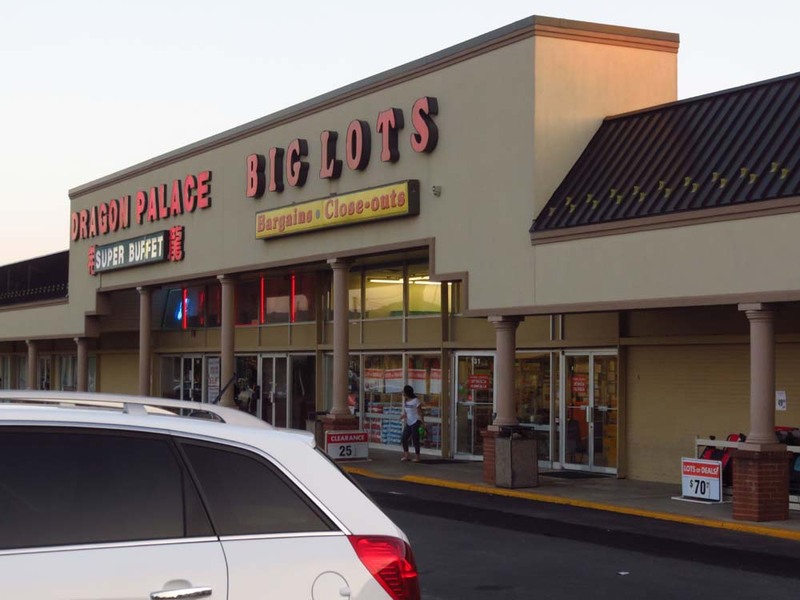 Quite a few of the former locations still exist today, most repurposed in some form or another since they were generally smaller stores of around 30,000 square feet that were relatively easy to redevelop. In all, it looks like the chain had at least 21 locations at its peak, and it catered to small and medium sized markets. 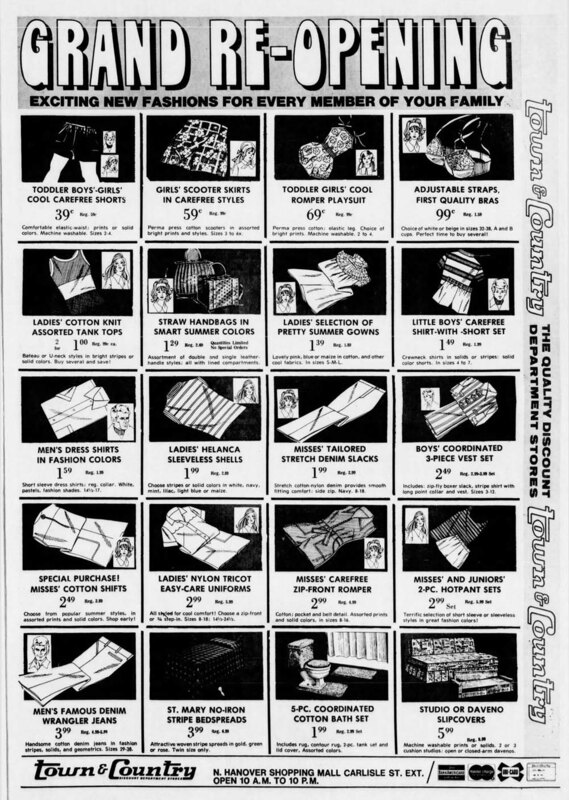 It is not entirely clear how Town & Country was marketed, but judging by the ads they were a store that focused a bit more on hard lines than soft lines (although its parent company was a clothing store), and it sold a little of everything sort of like Kmart did at the time. Its catchphrase was that it offered a "Golden Guarantee". 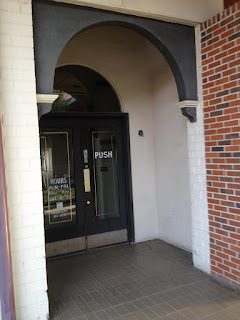 While the stores carried a wide variety of merchandise, they did not appear to offer any services such as a pharmacy, auto center, garden center, restaurant, optical, etc. This explains how they could offer a wide variety of merchandise in only a 30,000 square feet store. Perhaps this lack of services was a factor that led to their demise since it was not an all-in-one shopping experience. 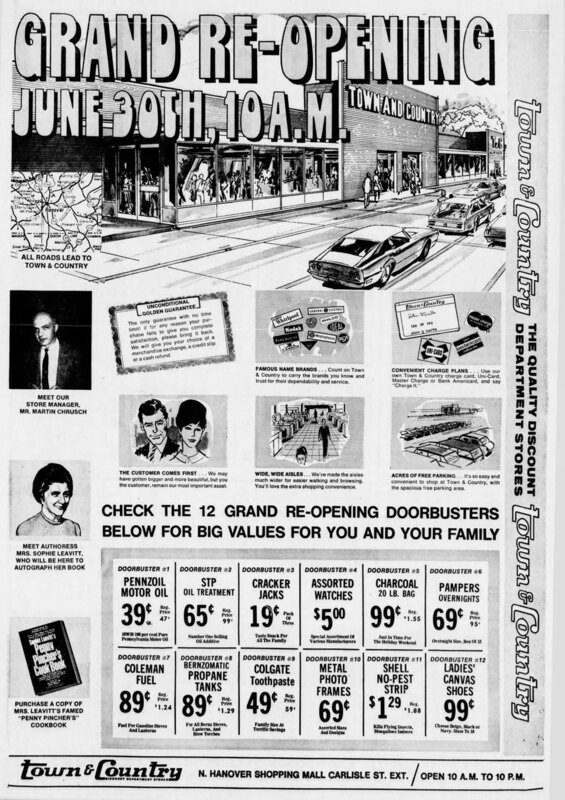 It made it difficult to make them stand out against competitors like Woolworth/Woolco, Murphy's Mart, and Newberry's. It seemed that Kmart's expansion into its territory was what led to its seemingly planned demise. No mention was ever made that the store chain was actually unprofitable as a reason for its closure. Most likely it was a corporate decision to focus on their core business: Lane Bryant. 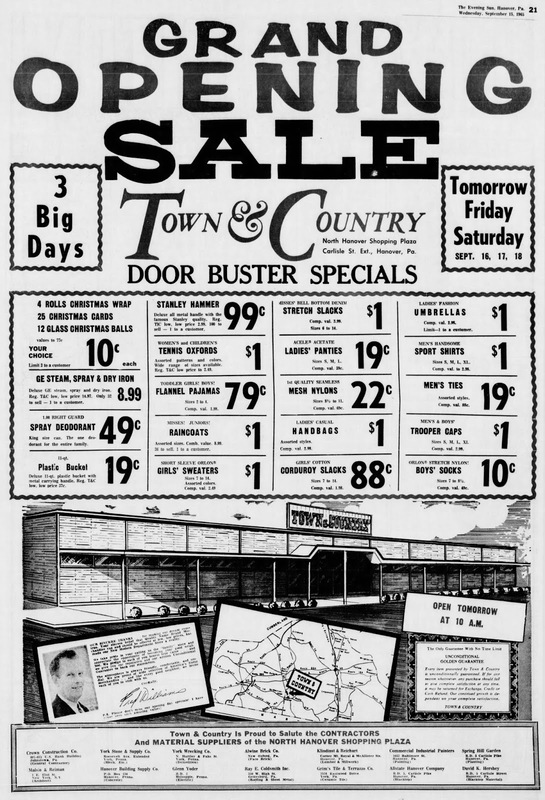 Town & Country grand opening flyer at North Hanover Plaza in Hanover, PA in 1965. It was the 12th in the chain. Image from "The Evening Sun" from September 15, 1965. 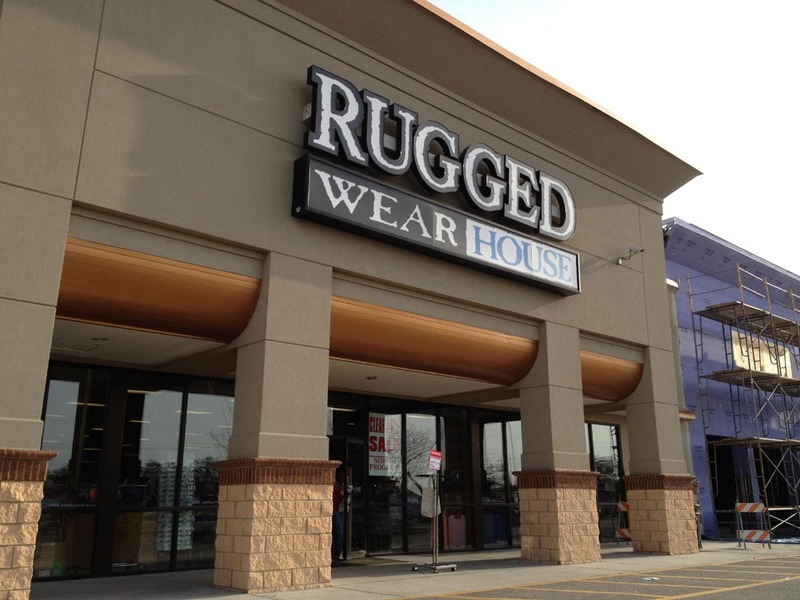 Clearly the logo didn't match the exterior in the first iteration of the store. It would be replaced with an awesome looking logo by the 1970's. Image from The Evening Sun from September 15, 1965. 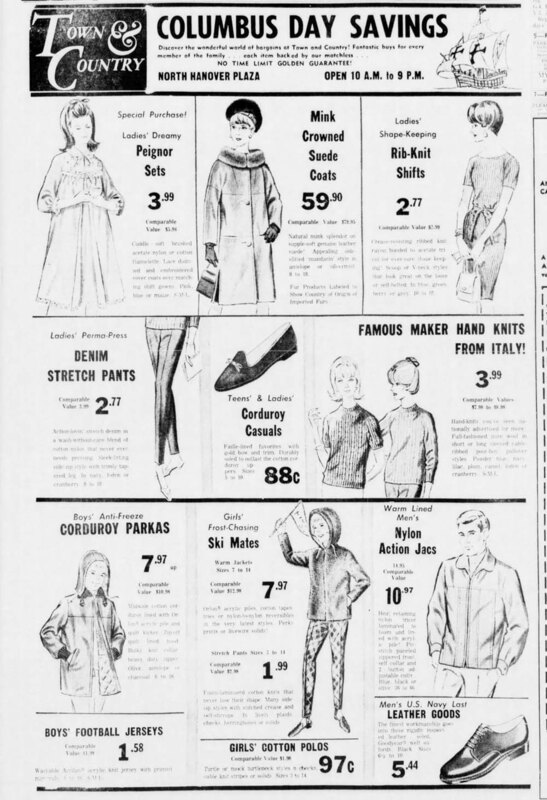 October 12, 1966 ad from The Evening Sun. 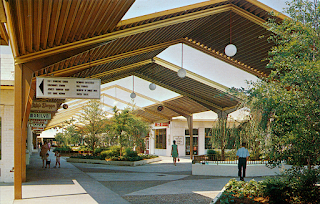 1970 saw the enclosure of North Hanover Plaza into North Hanover Mall. 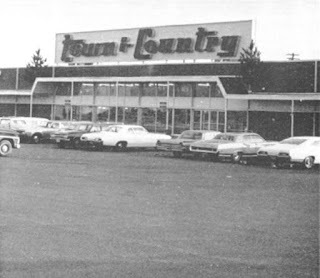 The portion with Town & Country was fronted by an enclosed strip that ended at the former store. Kmart looks to have greatly expanded the store in later years. Image from April 1, 1970. The 1971 reopening introduced us to that AMAZING "turbo" logo that was in use in the first part of the decade. 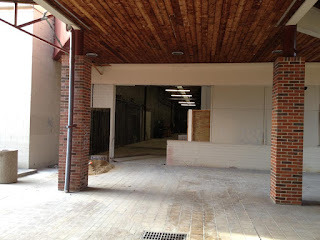 Note the update to the entrance to accommodate the enclosure of the strip in front of the store. Image from The Evening Sun from June 29, 1971. The interior of the updated Town & Country at North Hanover Mall. It looks small and cluttered by today's standards, but this was apparently spacious for the time. Image from The Evening Sun from June 29, 1971. The store chain used three different logos, and the second generation logo was memorable...a mid-century turbo-style font. Many of their stores featured a distinctive "hooded" canopy feature over the front entrance with sloping sides and a glass front that was quite similar to classic Mobil stations built during the same period. 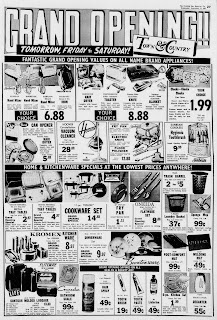 Not much else is known about them except that they went out of business in 1977, and Kmart took over many locations as an attempt to expand into the Mid-Atlantic region. 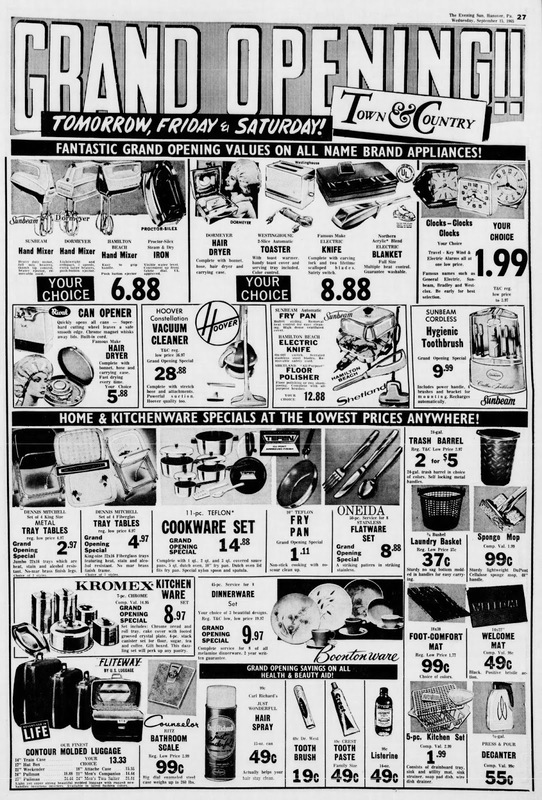 Kmart locations that opened in these stores operated into the 1990's. 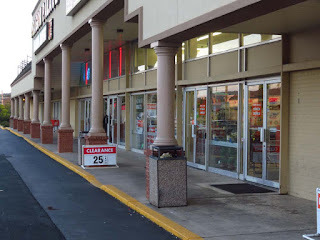 That means that most likely Kmart was willing to finish the leases on these stores considering that they likely operated on a 30 year lease with most locations open only around 10-15 years as Town & Country. One more flyer from the grand reopening. Image from The Evening Sun from June 29, 1971. 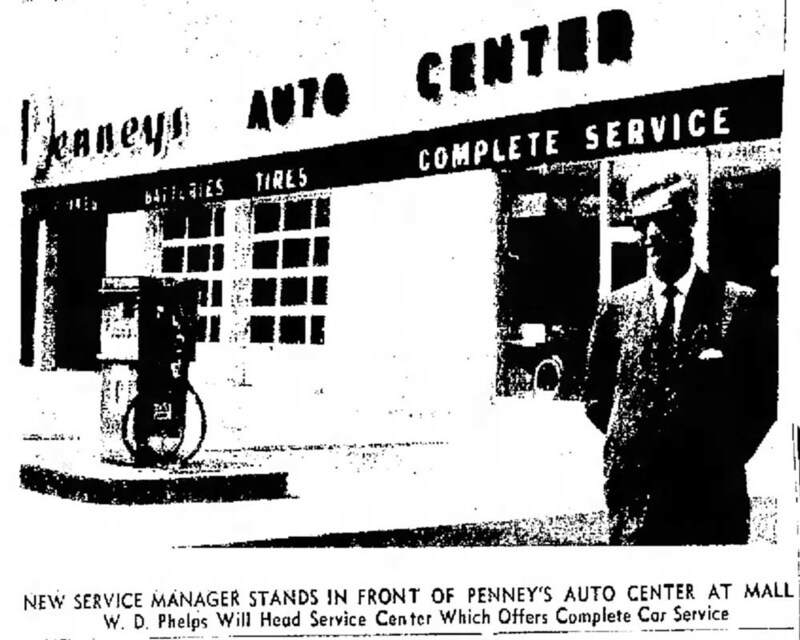 Constant logo changes could not have helped the bottom line of Town & Country. 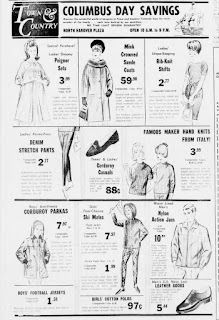 This is the third and final version as shown in this ad from The Evening Standard from June 29, 1974. Norman Rockwell dads are waiting to be showered with gifts on Fathers Day. They also want you to make sure you shop the specials at Town & Country! Image from The Evening Standard from June 29, 1974. 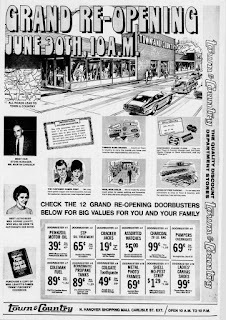 Maybe the Blues Brothers should have crashed into Town & Country instead of Dixie Square Mall, because "This place has everything!". Image from The Evening Standard from June 29, 1974. The New York influence comes out in this ad. 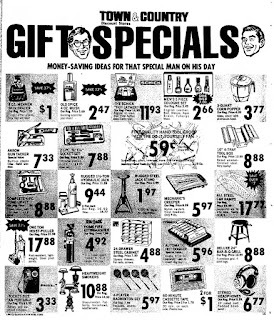 It was pretty clear that "Every day's a sale day at May's" was playing through their head when they came up with that slogan. 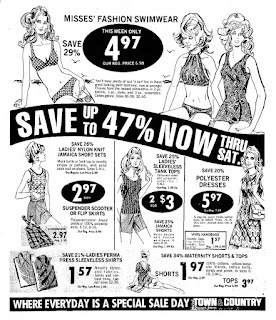 It's also a bit ironic to see bone thin cartoon women with no butts in a clothing ad from a store whose parent company is Lane Bryant. Image from The Evening Standard from June 29, 1974. 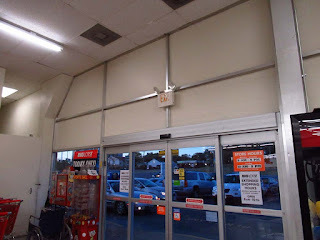 Kmart has since closed or replaced every store that originally opened as Town & Country, all much smaller than the typical Kmart. Along with J.M. 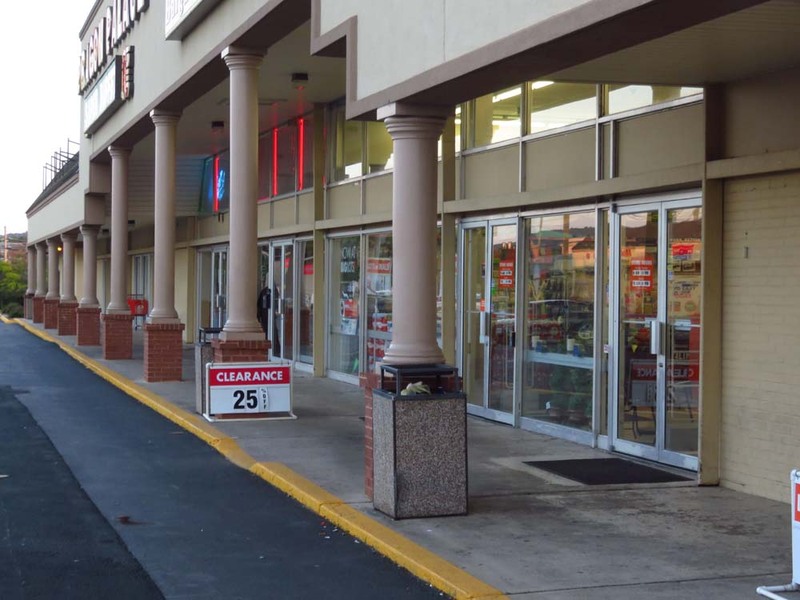 Fields and others, it was one of the early casualties of the highly competitive discount store market that today is down to primarily just Wal-Mart and Target with no regional discount stores left in the Mid-Atlantic states. 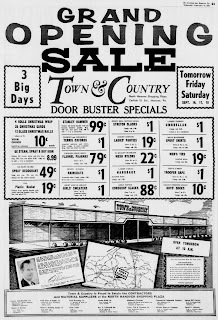 Stores like Ames, Hill's, Murphy's, Jamesway, Clover, and others were all later casualties, but they lasted much longer than Town & Country and had a more significant footprint. Part of why I wrote a post on this store is that I kept bumping into these stores. When I saw this former store in Harrisonburg, VA, I was DYING to know what store it used to be. Needless to say, finding out it was an obscure discount chain nobody had ever heard of was pretty exciting. Look closely and you can see the angled canopy, which has been largely covered up on the front with this detestable stucco update. The unceremonious end of Town & Country usually ended up like this one: a single store subdivided into two or more stores. 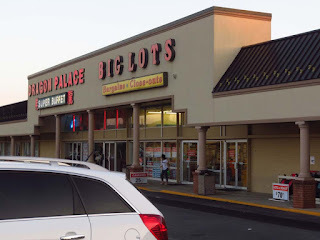 Of course, this Big Lots has obviously been here awhile as it still sports the older logo. Interior detail, including angled canopy, at the Big Lots (former Town & Country/Kmart) in Winchester, VA.